Believe it or not, sometimes I eat without my foodie-call Ziggy. While its never the same as eating with my dear companion or with my dear wife the Hummus Punisher, I’ll resume coverage of my independent food experiences with this column. With winter just around the corner, wannabe foodies and pepperazzis (obsessive food photo snappers) indulge in tomato soup at hale & hearty soups. 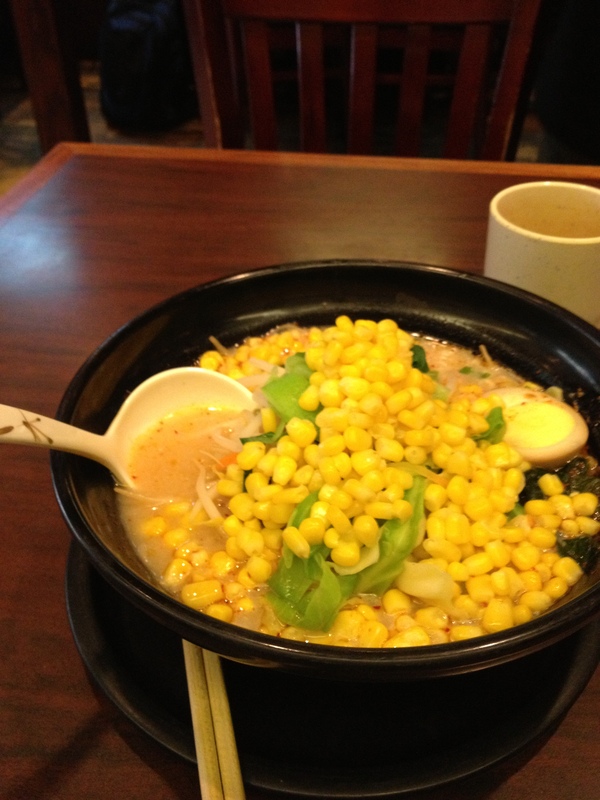 But I started the week with a $6.50 lunch special veggie Ramen at Ajisen Noodle on Mott Street and it’s just what the doctor ordered. It originated in Kumamoto of Kyushu, Japan in 1968. Their ramen is chewy, straight and thin coupled with the secret recipe of a tonkotsu soup base (white soup base from which bones, meat, vegetables and other fine ingredients are cooked for many hours producing a milky white broth). Did I mention that I usually hate soups? this post is a great way to offend my mother and mother-in-law as they have been given countless head shakes when offering soup. I decided to pass on the typical American-Chinese soups that you can find just about anywhere in America. Xi’an famous foods (cash only) is certainly not a typical Chinese establishment, with one other location in flushing Queens. Western Chinese cuisine of the ancient city of Xi’an is served here. The spicy cumin lamb soups is a fusion of Chinese and middle eastern cuisines at its finest. 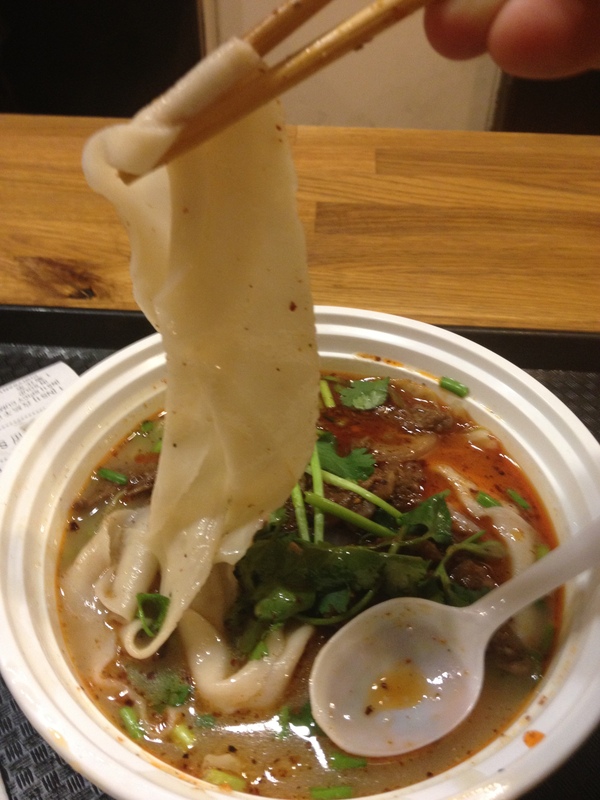 The soup had a pleasant aroma from the lamb-bone broth with one delicious extra long flat hand-pulled noodle. Noodle quality is superb for $8. This father and son run place seats about 20 ppl so get here early as it packs up fast with a long line outside. Looking around at the plates at the two communal tables, this place is giving Mission Chinese a run for its money in terms of quality and price. This is definitely my favorite of the group, more to come on this place. For a hip, minimalist atmosphere, stop by Bassanova (cash only). With the original location in Japan, this newcomer opened in July 2013 in a convenient spot around the corner from canal street. In addition to other platters, they serve only three Ramen soups in ceramic bowls imported from the original’s hometown of Setagaya. I enjoyed the Tondaku green curry ramen while sitting at the steamy bar with a boom box playing hip-hop. 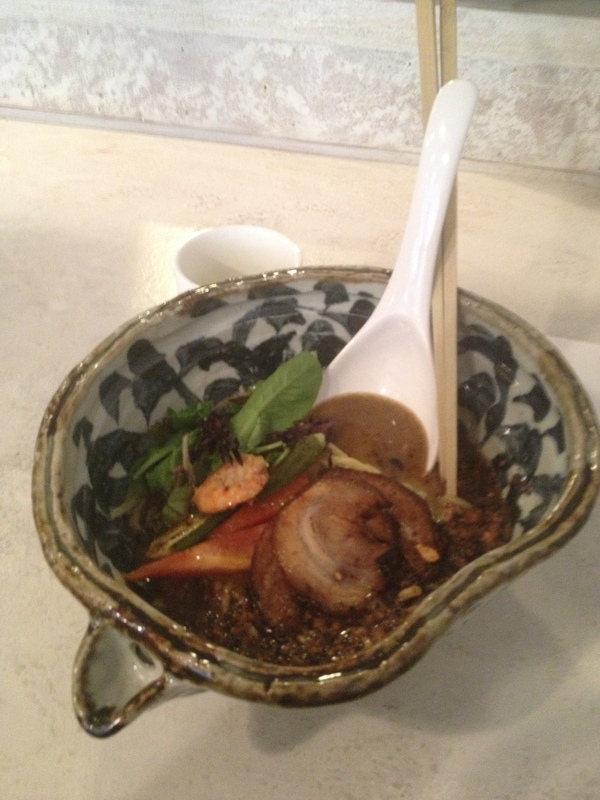 Despite a disappointingly steep dollar to Ramen ratio for any ecconoisseur, the soup displayed colorful ingredients such as moist grilled Berkshire pork, mixed greens, shrimp, okra, and red bell pepper, and a secret base with a good hint of green curry. I attacked this soup with brutal force. Who knew Ramen soup would taste so good while listening to “gangsta’s paradise” and enjoying the “Prado” wallet you just bought on Canal street for your girlfriend.